Volunteers set off to fight invasives at Warren State Park. Photo by Mark Wedel. Volunteers treat invasive species at Warren State Park. Photo by Mark Wedel. Warren Dunes State Park. Photo by Mark Wedel. Spotted Knapweed, an invasive plant at Warren Dunes State Park. Photo by Mark Wedel. Heidi Frey at Warren Dunes State Park. Photo by Mark Wedel. From the towering glory of Sleeping Bear Dunes to more modest southern Lake Michigan beaches, perhaps nothing in our state represents "Pure Michigan" better than our iconic sand dunes. But as with so many of Michigan's fragile native ecosystems, invasive weeds threaten to strangle the dunes. Exotic fungi and invasive bugs are killing the trees that are part of the dune ecosystem, while invasive water plants are choking coastal marshes and interdunal wetlands. There are around 550 miles of coastline on the Mitten's west that are under siege from alien invaders. Luckily, the combined forces of the Michigan Dune Alliance are on a search-and-destroy mission throughout that long stretch of sand. Shaun Howard, Eastern Lake Michigan project manager of the Nature Conservancy, says that preserving Michigan's dunes is a no-brainer. "It's the world's largest freshwater dune system," says Howard. "It's globally rare. A very unique place. And I think a lot of us, especially in West Michigan and around the Great Lakes in general, lose sight of that. We have a tendency to take that amazing shoreline for granted." But that beauty depends on a complex system that can turn chaotic when thrown off balance. "The dunes are almost alive. They're a dynamic shifting mosaic of sand and species," Howard says. New homes and developments on the coast can stress the dunes, creating unexpected erosion, he says. And if you build in the wrong spot, expect to see your investment eventually "crumbling into the water," he says. Invasive plants can also cause the same effect. "When you have one species that outcompetes everything and dominates an area, it may alter those sand moving processes as well," he says. "Dunes are such a unique system, in that there's a set of plants and animals and processes that live or happen there, and nowhere else." That beauty is also "a major economic driver in the Great Lakes," Howard says. People from around the country flock to beach towns and parks. "Ecotourism and the draw to those areas are huge," he says. The dunes and coasts were one of the attractions of 2016's thriving tourist season, which the Detroit News reports may surpass the $20 billion spent by tourists in the state in 2015. And Sleeping Bear Dunes National Lakeshore has been full of sand-climbers since ABC's "Good Morning America" ran a 2011 poll choosing it as "The Most Beautiful Place in America." "We can't forget that we're also managing them for people," says Howard. "We all benefit greatly from the dunes being healthy and intact, and people wanting to go out and see them and spend their money when they go there." The Nature Conservancy first got to work surveying over 50,000 acres of Michigan dunes and shoreline. Howard reports that 75 percent of the invasive species on those surveyed acres, "have been removed or are under current management towards removal." But it's taken a lot of work. The Nature Conservancy first took at 1,800 acres of baby's breath around Sleeping Bear Dunes. The seemingly innocuous and pretty flowering weed, commonly used in floral arrangements, is a tenacious Russian invader. Pull it, and it grows again from a long tap root. As the Nature Conservancy managed to get the lovely weed cleared, they learned that they needed to implement an "EDR" strategy—early detection and removal. "If you can find the first invasive plant on the landscape and remove it, it sure is a lot easier than waiting for it to be everywhere," Howard says. They also learned it's important to be a part of a larger force of invasive-fighters. So in 2007, the Nature Conservancy joined the Michigan Dune Alliance and received funding from the federal Sustain Our Great Lakes grant program. Together, the Dune Alliance partners learned to use many tools, including pulling, herbicides, burning, and digging. Howard finds that "the majority of these plant species need to be controlled with chemicals, herbicide. It shows how aggressive they are. For a lot of these species, even pulling them out of the ground won't get rid of them." Another significant threat to dunes is Oriental bittersweet—a smothering vine with red/orange berries that was introduced to the country for use in ornamental holiday wreaths and promoted by the likes of Martha Stewart. Melanie Manion, Natural Resources Supervisor for Ottawa County Parks, suspects bittersweet has spread into Ottawa's parks from arts and crafts shows in the area. And while it's also suffocating dune vegetation in Indiana, it hasn't spread into Ottawa's dune areas yet. The parks system employs a dedicated paid staff supported by volunteers to manage those properties, embracing the early detection and removal strategy. Her most important tool is a GPS unit in the hands of knowledgeable staff that constantly survey and map-out where invasives pop up. They then turn to volunteers to start pulling. Sometimes herbicide is best, but other times that kills native plants, which leads to erosion. Manion's other big targets—not only on the dunes but in all of the county's parks—include autumn olive, honeysuckle, tree-of-heaven, phragmites, dame's rocket, multiflora rose and narrow leaf bittercress. Some have gotten out of hand and are no longer in the early detection stage, such as Oriental bittersweet and the ornamental shrub, Japanese barberry. Spotted knapweed and garlic mustard, two invasives that crowd out native plants and ruin the nesting areas for birds such as piping plover, are regularly pulled by volunteers, she says, who contributed over 10,000 hours of labor last year. Heidi Frei, Michigan DNR natural resources steward of Southwest Michigan, lists the same "usual suspects" of duneland invasives: garlic mustard, Japanese barberry, honeysuckle, autumn olive, etc. "They definitely have an impact on ecology," she says. But the DNR is also concerned about keeping the trees at the edges of the dunes alive and in-place. "When you talk about removing whole forests of one species, say, stands of oak trees, that has a potential to leave a dune absolutely barren, or open it up to invasive woody shrubs like Japanese barberry," she says. One bad spot is P.J. Hoffmaster State Park, a thickly wooded landscape bordering dunes on Lake Michigan between Muskegon and Grand Haven. Some of its woods have been thinned by oak wilt, an exotic fungus spread by sap beetles. The DNR has been fighting the disease since 2011, but this involves removing infected oaks before the disease spreads and cutting roots five feet underground between infected and healthy trees. Both the disease and the cure are destructive to the dunes when it spreads to the sand/woods border, Frei says. The disease was brought to the park by campers bringing in infected firewood, she says. A recent survey of campers at Hoffmaster and Holland State Park found that people bring wood from up to 600 miles away, in violation of federal and state quarantines. "I'm sure a lot of people aren't aware of it," she says. But each load of wood could mean another "emerald ash borer on our hands"—such as the Asian longhorn beetle, now infecting parts of Ohio, that could destroy the maple trees of Michigan just as the borer wiped-out most of the ash trees. "I would say that the biggest threat to the dunes is firewood movement," she says. "It just takes one load of firewood with just one insect or fungus on it, and then things are out of control." In her Ottawa parks office, Manion says dealing with invasives is like "playing whack-a-mole." Just as one invasive is brought under control, something new pops up. She points out that big environmental threats like climate change or massive habitat destruction can make one feel powerless. But invasive species are a threat "we can actually do something about" as individuals. "Every day I can pull something, kill something, change my behavior to make a real impact. There are many chances for regular folks to volunteer to join the fight," she says. "You don't have to be a Ph.D. to go out and pull garlic mustard." Manion hopes for better public education on the topic, to get people to look at these invasives as a form of biological pollution. "Because that's what they are," she says. "That pretty purple flower is the equivalent of an oil spill." Frei recommends getting involved with the thousands of yearly volunteers in state parks helping the DNR find and remove invasives. You can find more detail on how to get involved here. "If it were not for volunteers, those places would be entirely different," she says. Mark Wedel is a southwest Michigan freelance journalist who's covered a wide variety of topics. He's also visited Lake Michigan's shores every summer since he was in diapers. 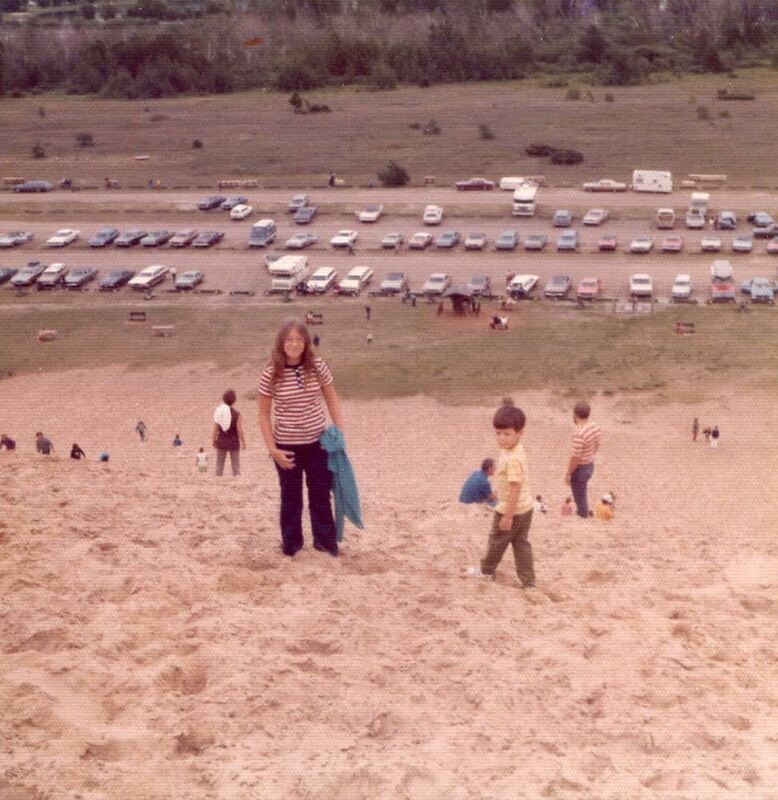 Author Mark Wedel and his sister Kathy Wedel at Sleeping Bear Dunes, sometime in the early 1970s. In memory of Kathy Wedel Peltier, who passed away Sept. 16, 2016.